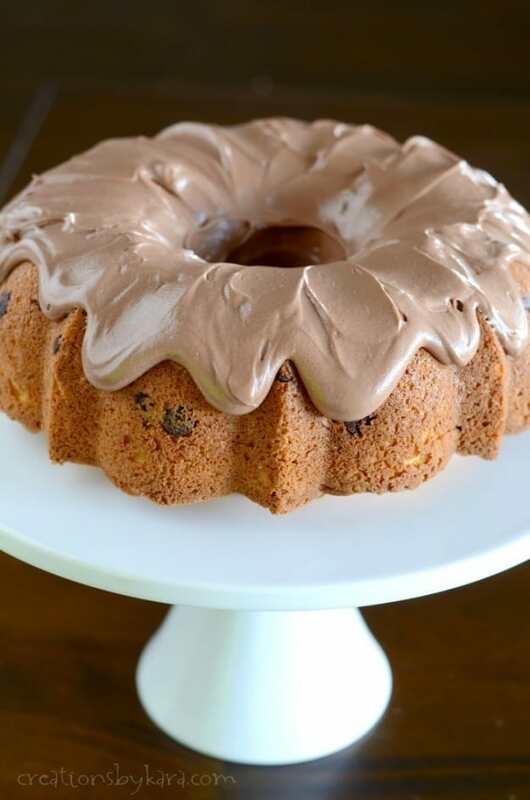 This Chocolate Chip Bundt Cake is super easy to make, and comes out moist and delicious every time. It’s actually so good that I didn’t even need ice cream with it. And that hardly ever happens in my world! Today is National Chocolate Chip Day. I can totally get on board with that, because chocolate chips are a staple at my house. I start to get a little jumpy when we’re down to two bags. I’m only aware of one time when we actually totally ran out and had NO chocolate chips in the house. We refer to it as the “Disaster of ’98”. It was a very scary day. 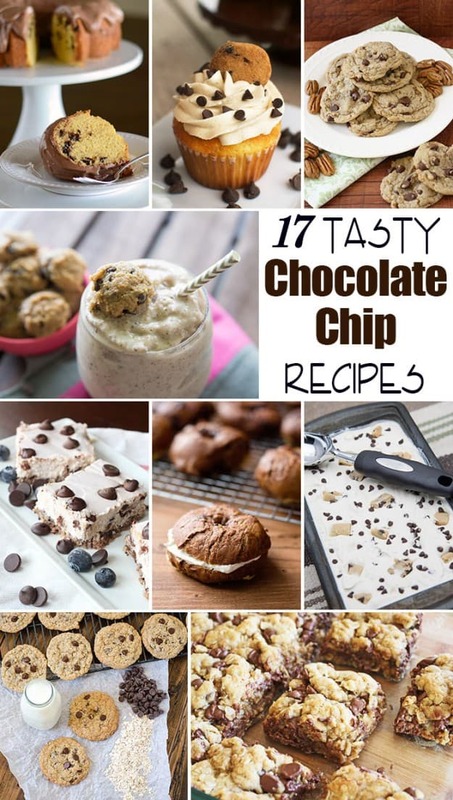 I hope that you have some chocolate chips, because you are about to be bombarded with over a dozen mouthwatering recipes featuring chocolate chips. Starting with this Chocolate Chip Bundt Cake. 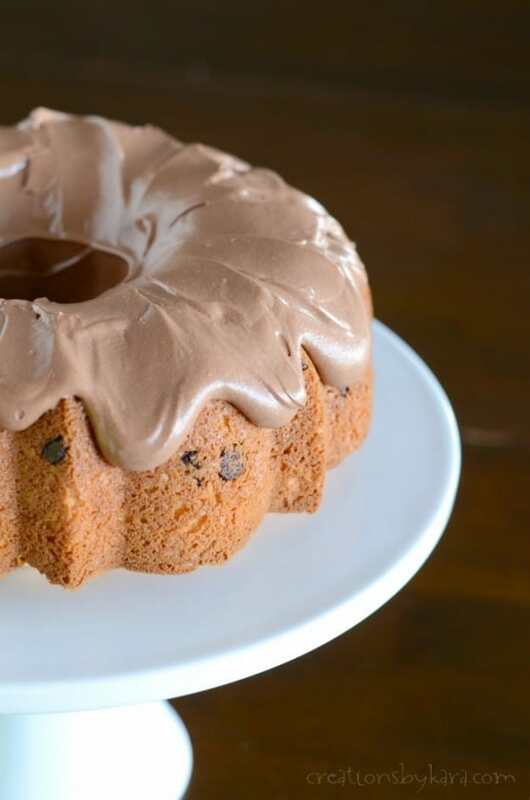 It starts with a cake mix, but since it’s made in a Bundt pan , it looks really fancy. Like you slaved. But you didn’t. It can be our little secret. I would have preferred to use mini chocolate chips in the batter. They work better, because they spread out more evenly through the cake, instead of sinking to the bottom (which ends up being the top). But alas, someone had finished off my bag of mini chocolate chips. I used semi-sweet, but if you prefer milk chocolate, go for it! Oh, and lest I forget, let’s talk about the frosting for a minute. It is heavenly! If all you’ve ever had is frosting from a can, you are seriously missing out. This homemade chocolate frosting can be whipped up in under 5 minutes. 5 minutes! That’s all it takes to have spoonfuls of melt in your mouth, creamy chocolate frosting that makes you want to hide in your closet and forget that calories are a thing. Make it! You won’t be sorry. 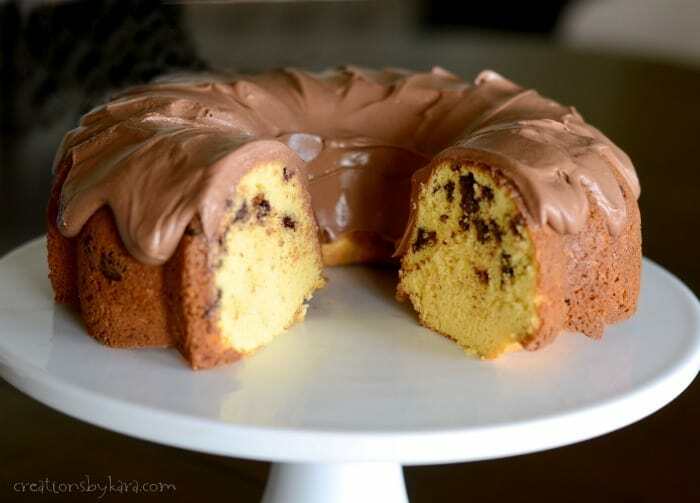 Yellow Bundt cake filled with chocolate chips and topped with homemade chocolate frosting. Combine cake mix, dry pudding mix, eggs, sour cream, oil, and water in a large mixing bowl. Beat till smooth. Fold in chocolate chips. Pour batter into a well greased and floured 12 cup Bundt cake pan. Bake at 350° for 45-50 minutes, or till a toothpick comes out clean. Let cool for 10 minutes in the pan, then invert to a cooling rack. Cool completely. For frosting: Combine butter, cocoa, salt, powdered sugar, vanilla, and 3 Tbsp milk. Beat till smooth, adding enough milk to get a spreadable consistency. It should be thin enough that it will run down the sides of the cake a little, but not be as thin as a glaze. 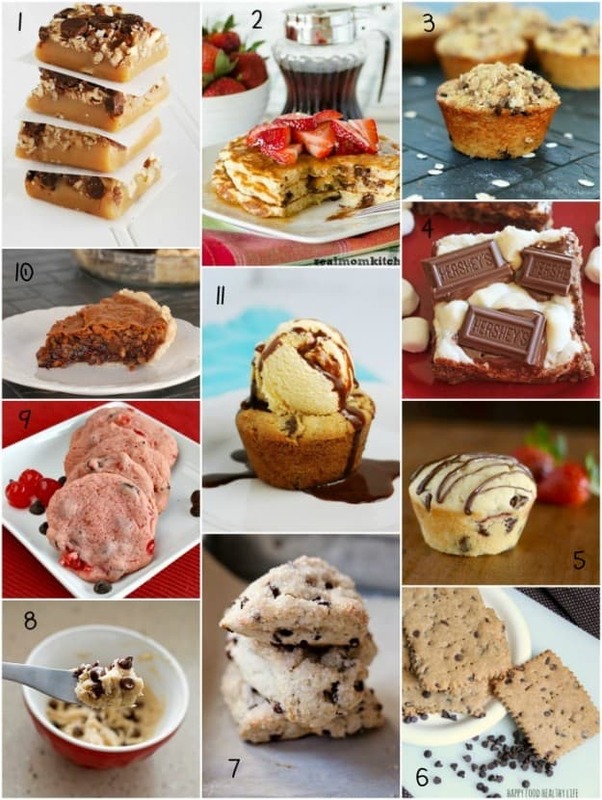 Here are a bunch more tasty recipes from some of my blogging buddies featuring the ever popular chocolate chips. Don’t they look amazing? 4-Chocolate Chip Cookie S’more Bars from Jamie Cooks It Up! This cake was delish and so easy to make.. I can’t have dairy, what can I use instead of sour cream? this looks so yummy I would love to make it! 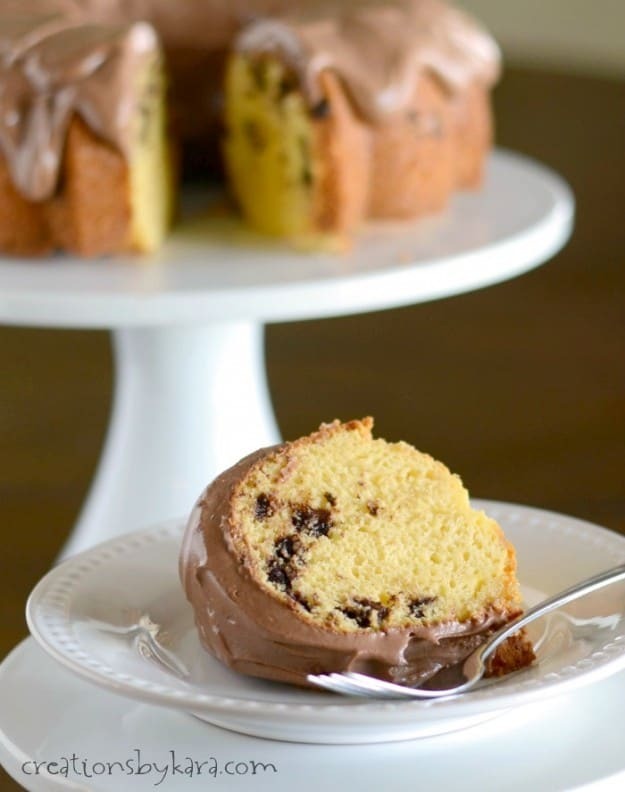 I love a good bundt cake! 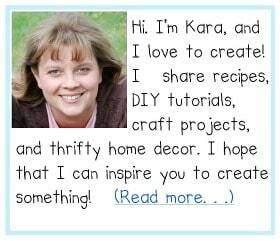 Added to my list to make! I have a bundt pan, but I’ve never used it! 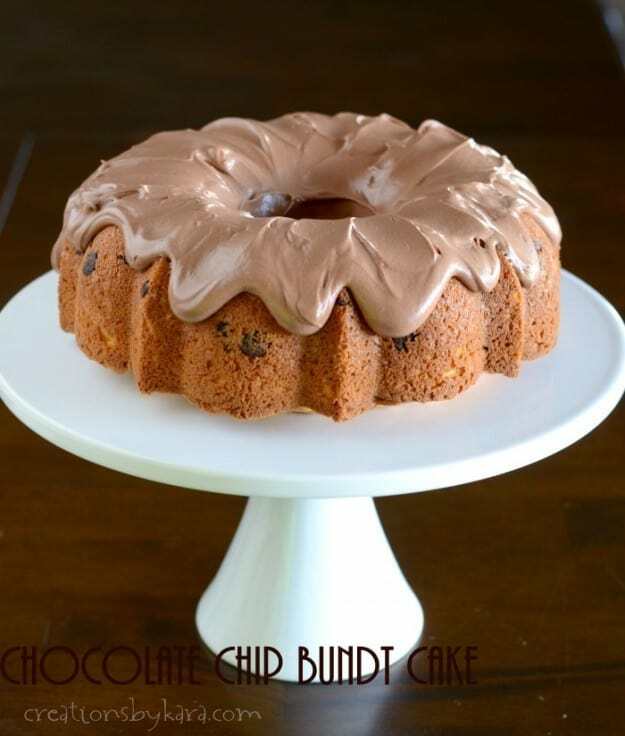 for shame, you have so many bundt recipes that look good I have got to try one! I can’t believe you’ve never used your Bundt pan. You are the queen of cake! This cake looks AMAZING!!! I love it!